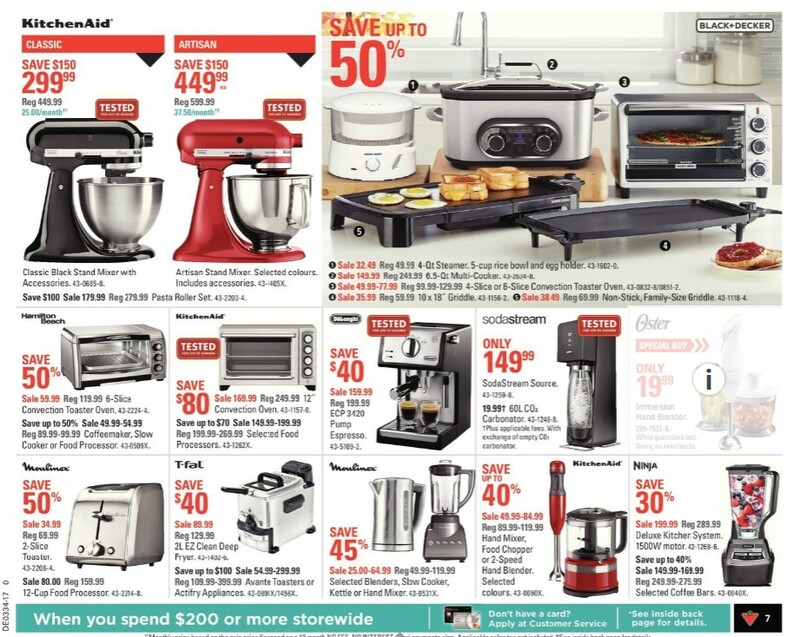 Canadian Tire KitchenAid sale valid Aug 18 - 24, 2017. 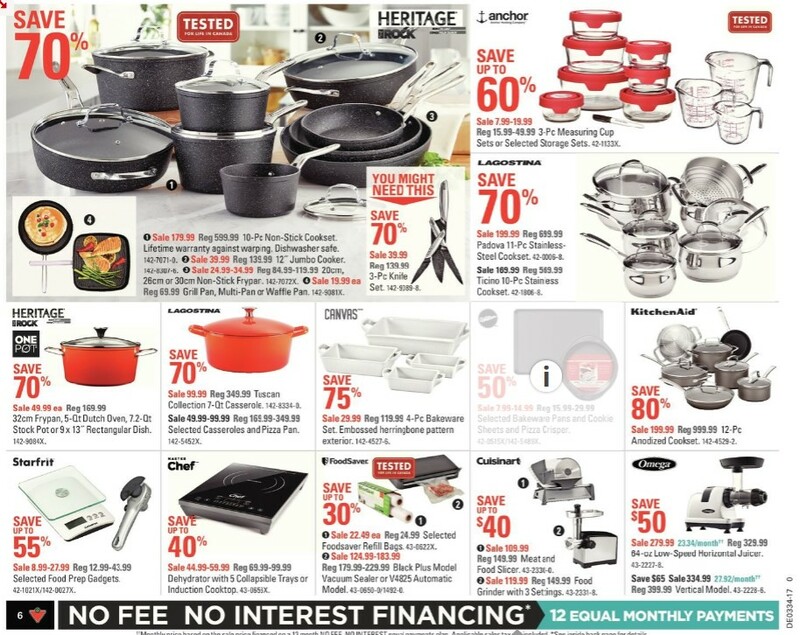 Find KitchenAid sale this week such as KitchenAid Anodized Cookset #:142-4529-2 Regular Price $999.99 -- with price $199.99 80% Savings 12-pc. 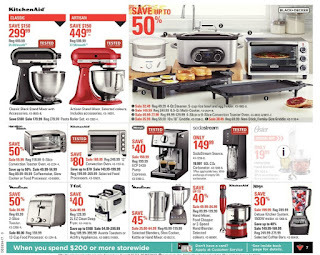 Stand Mixer #:43-1405X Regular Price $599.99 -- Price $449.99 $150.00 Savings Artisan. $37.50/month. Tested for life in Canada. Selected colours. Includes accessories. KitchenAid 12" Convection Oven #:43-1157-0 Regular Price $249.99 -- Price $169.99 $80.00 Savings Tested for life in Canada. 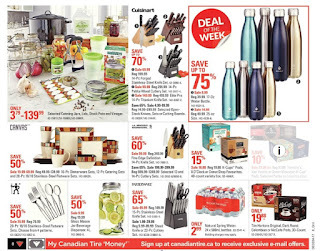 KitchenAid Hand Mixer, Food Chopper or 2-Speed Hand Blender #:43-0090X $89.99- Regular Price $119.99 -- Price $49.99-$84.99 Up to 40% Savings Selected colours. For Canadian tire flyer this week you can find Hamilton Beach 6-Slice Convection Toaster Oven Model #: 43-2224-4 Regular Price $119.99 - Price $59.99 50% Savings Large, curved glass door and auto-advance rack improve access to food. Black+Decker 4-Qt Steamer Model #: 43-1602-0 Regular Price $49.99- Price $32.49 Up to 50% Savings 5-cup rice bowl and egg holder. 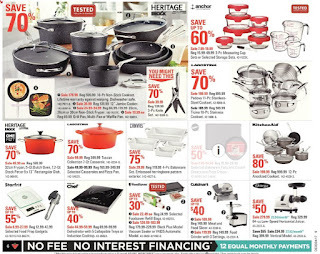 Black+Decker 6.5 Qt Multi-Cooker Model #: 43-2634-8 Regular Price $249.99 - Price $149.99 Up to 50% Savings Black & Decker multi-cooker provides convenient and easy one-pot cooking. Black+Decker 4-Slice or 6-Slice Convection Toaster Oven Model #: 43-0832-8/0851-2 Regular Price $99.99-$129.99 - Price $49.99-$77.99 Up to 50% Savings Electronic toast control indicates your preference. Black+Decker Non-Stick, Family Size Griddle Model #: 43-1118-4 Regular Price $69.99 - Price $38.49 Up to 50% Savings Keep the extras hot until you're ready for seconds in the convenient warming tray. Black+Decker 10 x 18" Griddle Model #: 43-1156-2 Regular Price $59.99 - Price $35.99 Up to 50% Savings Great for cooking a wide assortment of meals, from breakfast to dinner and snacks.